We’re going to take a look at all the kayak storage solutions that you can use to avoid tripping over the kayak in your garage. Let’s get started so you can spend less time shopping and get that DIY project taken care of sooner! 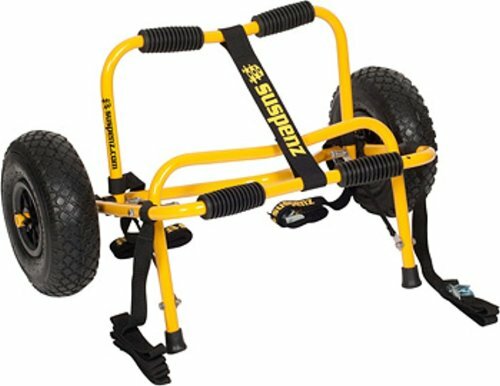 For more of my top gear recommendations, have a look through these popular Outside Pursuits guide links: Kayak Paddles, Kayak Roof Racks, Kayak Carts. Our reviews of the top rated kayak storage racks with a comparison table and our buyers guide below will help you choose a rack for you. If you’re the kind of person who likes an immaculate garage and loves to kayak, this free standing kayak rack might be for you. Made with caster wheels, you can store plenty of boats on this portable rack to make efficient use of your good-looking spaces. Made from coated steel, this kayak storage rack sits on the garage floor. You can load three boats on each side. Thanks to the slight angle on the holding arms it’s a little easier to get boats on and off. If you prefer a more permanent solution you can take the wheels off and mount the whole kit to the floor (if you’re crafty). One of the nice touches here is that each of the storage arms for the boats is coated with padded foam. This means there’s less chance of scratches or damage to your expensive kayaks. Users also praise the ease of assembly. 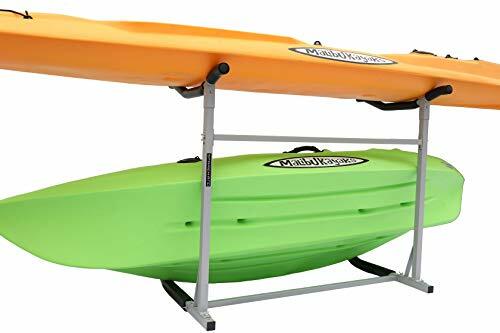 If you’re looking for the best kayak storage rack for semi-portable floor storage for several boats at a time, the Ajillis is for you! These kayak wall racks are so flexible and easy to install it’s hard to find a fault. Thanks to the simple design they can be mounted to almost any wall and they won’t break the bank doing it! These square steel racks come as individual armatures that can be screwed in and placed anywhere. They’re made from rust resistant powder coated steel which can last for a long time either in the basement, attic, garage or even outdoors. 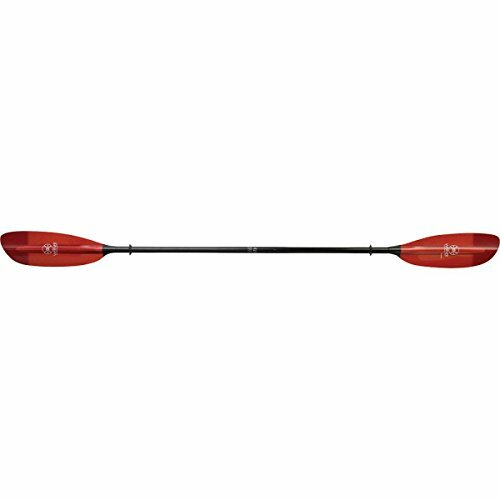 At less than 20” of protrusion, or how far they stick out from the wall, you’ll save room by getting the kayaks up on the wall. Plus it’s easy to stack them so you can make a row of these to store several boats above one another so long as your wall has enough space. Each pair can hold up to 100 pounds but make sure you install them properly. Screw them into a stud and not into drywall. I think this is best kayak wall mount on the market at any price! If you’re like me and there’s just too much stuff in your garage it may be time to make use of the ceiling. No matter the size of your kayak it will be easy to strap it in and hoist it up where the boat can remain easy to access but conveniently out of the way. Maybe one of the coolest factors about this kayak ceiling hoist is that you can store practically anything. 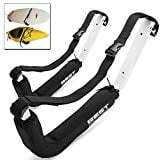 There are straps for wrapping up a kayak and hooks for clipping to a ladder, bike, or anything else you can think of. No matter what size or shape boat you have you’ll be able to find a way to hoist and store it. Yes, it does take a little bit of DIY to get these installed. However, all you need are a couple of screws (included) and a drill – you’re done! Just to clear things up, this kit comes with two complete sets of storage hoists. That means there is four of everything because each set requires two pulleys. The Rage Powersports is the best kayak hoist that can be used for almost any type of boat or products. Similar to one of the earlier models we looked at, this kayak rack for your garage is stationary and lacks wheels. That may be fine, however, for those with only a couple boats. Stash it against the wall and keep things out of the way without putting holes in the wall! 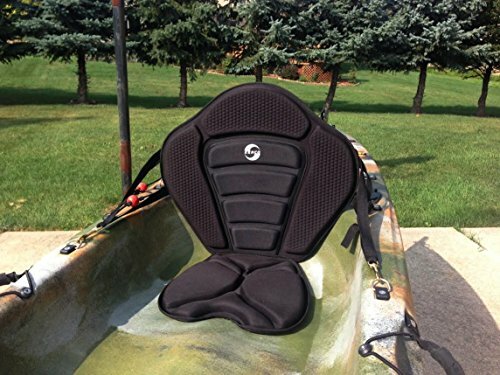 At 90 pounds for the top and 120 pounds for the bottom boat cradle, you should be able to safely store a kayak of any size without a problem. Each cradle arm is 47” from the other one so they’ll be universally compatible. Plus they’re heavily padded to prevent dings and scratches. In case you’re wondering, the bottom cradle arm can hold one kayak that is 35” wide or less. 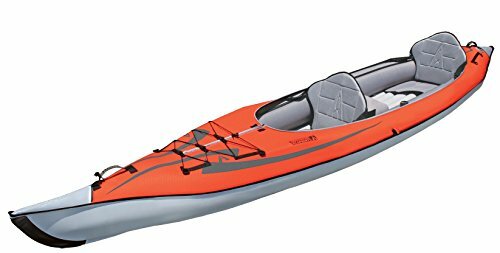 I’ve yet to see a kayak wider than that, so you should be in the clear. One feature I’m sure will appeal to many is that this kayak rack needs zero tools to assemble. Everything goes together with included wingnuts! The Sparehand is the best kayak storage for those who prefer toolless construction for a maximum of two boats. This one is possibly the most customizable and versatile kayak rack on our list. 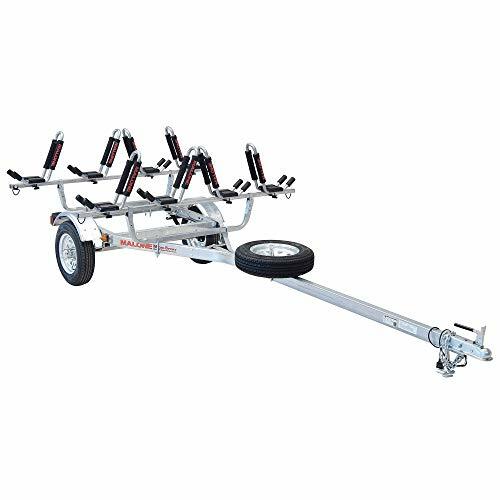 There is room for up to 6 kayaks and you can adjust the height and spacing of the racks almost limitlessly to make this rack work for your boats. Another floor standing rack, the biggest differentiator here is that you can choose the heights and spacing of all the arms. Each of the four padded arms can be moved up and down using two bolts which secure the steel structure. Additionally, there are two padded foam bumpers on the bottom of this rack where two more kayaks can fit. Be sure not to exceed the 500-pound limit when you load this rack with your gear. Some users even suggest there’s enough room for a bicycle or two if you get crafty! Before you purchase, make sure you have room for the 83” height of this rack. Remember, there is some DIY needed to assemble this one. 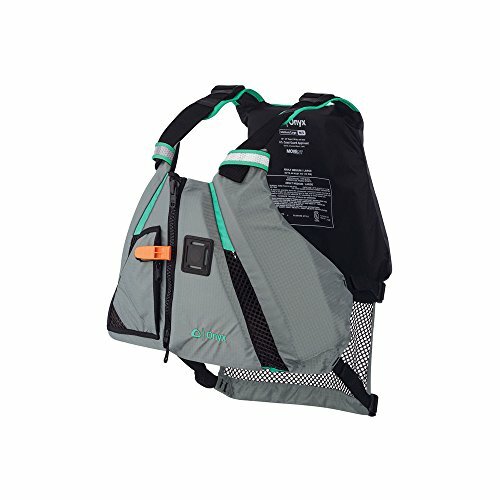 The Rad Sportz is the best way to store a kayak in a garage that can be used for many types of gear. Last but not least is this kayak ceiling storage hoist from Delta Cycle. As the name might imply you can easily store your paddle board, kayak, or bike by hoisting it to the ceiling with easy to install hardware. Just to keep things clear, this versatile ceiling hoist does have a 50-pound weight limit so don’t go too crazy. That said, you can order it with or without straps. 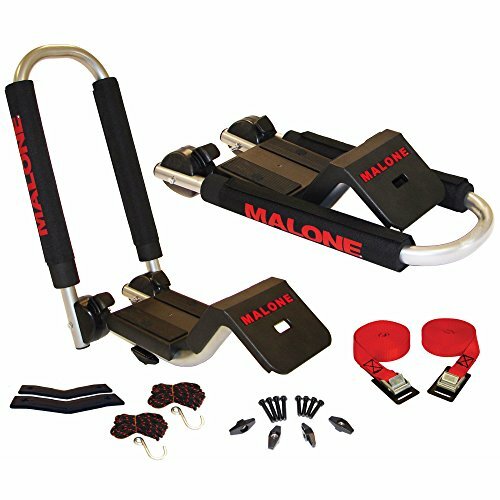 Use your own straps to save money when lifting your boat. Included is all the hardware you’ll need to mount the pulleys to a level ceiling surface. Just be sure that the screw goes into solid wood and not only drywall! When fully stored your kayak will hang about 6” below the ceiling. Add in the depth of your kayak and you’ll see how far down the boat will hang. Some simple math will tell you whether or not you’ll be bumping your head on the keel of the kayak so do your homework before you buy. Probably the best feature about this kayak pulley system is the quick-release auto-locking mechanism but some users complain that it can jam up. Best for storing a single boat on the ceiling of your garage or pole barn. This one takes a little forethought and planning. Get it right and you’ll have an efficient and good-looking kayak storage solution. Get it wrong and you’ll be frustrated. 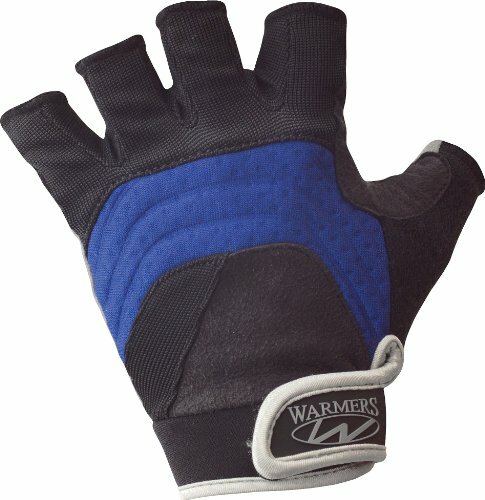 These are a great option because they’re easy to reach. They can easily go on any wall indoors or outdoors. For instance, you could store your kayak on the side of the shed, on the wall of the porch, or somewhere in the boathouse. Maybe the biggest downfall is that you have to put some holes in the wall and screw them into it. Floor stands are nice because you don’t need to put holes in the wall at all! Boats remain easily accessible at an arm’s reach. However, on the downside, a floor stand takes up a lot of floor space. These are best for people who have lots of space to use and should be avoided if you have a cramped garage or barn. Thus style can be a bit hard to set up. You’ll need a ladder, some tools, and a bit of DIY instinct. Once installed, however, they allow you to store your kayak in an area where most people have plenty of extra space! If you’re out of floor space and your walls are taken up with storage already, just look up! 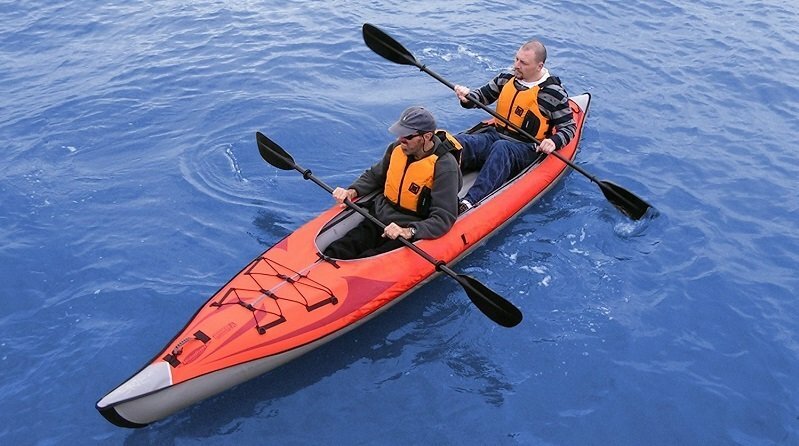 Most kayaks weigh somewhere around 30 pounds or less. Of course, this can range a lot depending on what kind of boat you have. Before you buy a kayak storage solution be sure to check your user’ manual on your kayak to verify its weight will be compatible. Maybe the most catastrophic result of failing to pay attention to this would be having a kayak fall from the ceiling when a ceiling mounted storage breaks and drops your boat onto your head or on the car! It should be noted that wall and ceiling mount storage solutions must be properly installed. Be sure to drill and screw directly into a stud to avoid ripping out the drywall and having your boat fall to the floor. This isn’t much of a concern for ceiling storage. However, kayak floor racks, particularly those built for multiple boats, usually have a size restriction. Check the storage rack that you’re thinking about buying and confirm the maximum width of boat it can hold. Sometimes with fixed-width arms, some boats or paddle boards may struggle to fit. Before you buy think about how good you are with tools. If you’re a total novice or just know that you’re the type to fall off a ladder… maybe look for a toolless assembly option. For those who want maximum DIY versatility, however, ceiling mounts and wall mounts make great options that will open up space around your home. Many of these ceiling pulley options and vertical floor stand options do require some DIY measuring, bolt installation, and configuration. As we all know, assembly instructions are rarely thorough so invite a friend over who has some mechanical aptitude before you get started! Some of us have half a dozen kayaks. Most of us, however, have one or two. If you’re like me then you probably love to do tons of different outdoor activities. Bikes, boats, fishing gear all builds up quickly! So, what can we do to get all those various tools or pieces of equipment taken care of? I think wall hooks and ceiling hoists are probably the most versatile options. With a ceiling hoist, you can store ladders, boats, bikes, and more! Plus you can take advantage of ceiling space that otherwise wouldn’t get used. Wall hooks are far easier to access for stuff you’ll use a lot. Again you can easily store your mountain bike, ladder, or other gear on these hooks when the kayak is elsewhere. When it comes to kayak racks, however, they’re a little more niche and dedicated to kayaks only. A: Most people can assemble or install just about any of these. Most floor stands just need a couple bolts which you can easily take care of with an adjustable wrench. Wall mounted hooks usually install with long screws directly into the studs behind your wall. Use a stud finder to locate the best spot and then install with the provided hardware or some 3.5” screws. Of course, a level and a tape measure helps too! Ceiling mounted hoists may need a little expertise. At the very least you should probably consider having a helper to hold the ladder and juggle tools. Like wall mounted racks, ceiling hoists usually screw right into the studs in your ceiling joists so a stud finder may help! I will say when in doubt, seek help. Q: Do I need to secure my kayaks? A: In most cases, probably not. Floor stands are probably okay without straps or anything to secure. Ceiling hoists, of course, do need to be secured. Some come with auto-lock features but I wouldn’t fully trust that if your kayak is hanging somewhere critical like over your car. Consider finding some way to tie the rope off to your wall in an out-of-the-way location. Wall mounts are probably fine without being tied down with one exception. Consider using a cable or chain to secure and lock your kayaks if you store them outdoors where someone might come by and snag them. Q: How easy is it to access my kayak? A: Floor and wall mount racks are by far the easiest to get to. Usually, there’s nothing more to it than just pulling the kayak off and loading it in the truck. 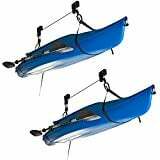 Ceiling mount kayak holderskayak holders are the ones that you need to think about carefully before buying. If you’re the type of person to use your kayak daily a ceiling mount may not be right for you. It can take a minute or two to strap up your kayak and lift it up or lower it. Of course, this isn’t a lot of time but it can start to feel like a hassle if you have to do it every day just to get out on the water. Q: Can I use my storage option outdoors? A: While it is possible to use any of these kayak storage units outdoors, there are a couple things to keep in mind before you do. Security can be an issue with kayak storage outdoors. For any kayaks stored outdoors, I would recommend using a vinyl-coated steel cable to lock and secure your boats. 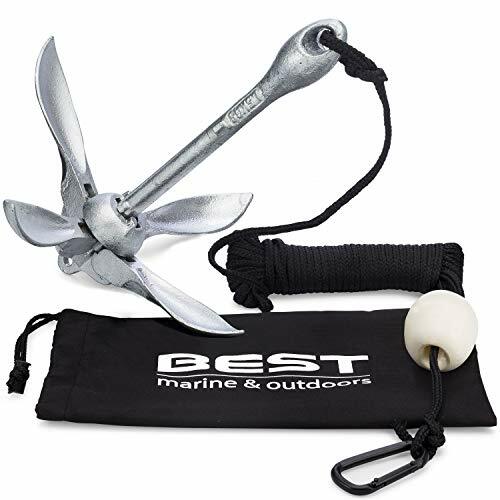 If you’re leaving your boats unsupervised for days or weeks at a time (such as an occasional use summer cottage) beware that even the best cables and locks can be easy for a thief to snip. Weather is a factor for both the kayak and the storage unit itself. 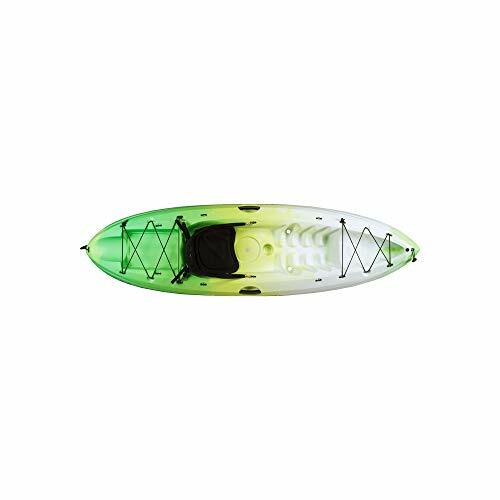 UV raysUV rays will eventually degrade even the best kayaks so try to store your boats out of direct sun. Rain and winter ice will do a number on any steel storage hardware. Look for powder coated steel racks if you’re going to use them outdoors. Q: Which type of storage is the cheapest to use? A: Maybe you’re like me and you’ve just got one boat. You may feel like you just don’t need anything too fancy or expensive. We’re DIY type of people. By far the best option is to purchase something simple like the Best Kayak Wall Mount. These simple L-shaped steel arms bolt or screw into any wall. If you’re crafty you can use them on concrete block, studs, or walls. With an option like this, you can choose how high they’re set, how far apart they’re set, and where you want them around the house or garage. Plus, they’re super cheap compared to other fancy options so that’s a win-win! No matter how many kayaks you own or plan on getting we have an option for your boats. I tried to make note of which options are easy to install, most versatile, and how many boats they all hold. If you follow our “how to choose” section you’ll have a good idea of what to keep an eye out for! It’s easy to buy the first kayak rack you find at a good price. Do you have room in the garage though? Have you considered storing your boats on the ceiling? We’ve covered all of these options for you so you can pick the best kayak storage solutions for yourself and spend more time enjoying the water. 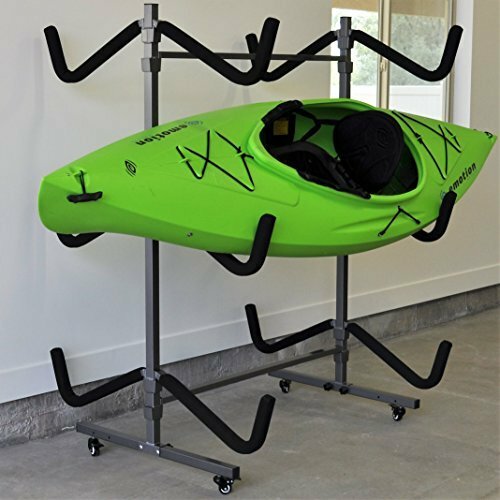 The Ajillis 71 is our Editor's Choice as the best kayak storage rack with its combination of ease of installation, capacity and quality.